Across the country, and especially in New England, siding, whether it is fiber cement or wood, are popular exterior veneers. With the new insulation or energy efficiency requirements, the two siding types, along with other exterior wall types, are subjected to potential moisture issues. For this particular residential home in New England, the contractor was concerned with potential moisture issues, which could lead to cupping, warping, and ultimate failure of the exterior siding. 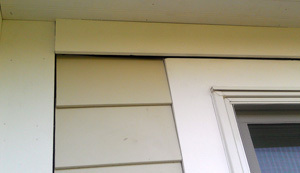 In this case the siding was lapped wood siding. A decision was made to incorporate Keene Building Products’ Driwall Rainscreen 020-1 to alleviate any concerns related to moisture. DriwalI Rainscreen 020-1 is a quarter-inch thick drainage and ventilation mat used behind fiber cement, wood siding, and other exterior wall systems. The entangled net drainage and ventilation mat eliminates incidental moisture penetrations and problems in siding applications. With the increase in energy efficiency in the building envelope, there is less potential for thermal leakage. By eliminating this ventilation method, fiber cement and wood siding has seen an increase in moisture issues. It is essential to have a means of drainage and circulation of air to help prolong the life and look of the lapped siding. Driwall Rainscreen 020-1 is installed over the weather-resistant barrier, which will separate it from the fiber cement or wood siding. This airspace that is provided by the Driwall Rainscreen, will assure that any moisture that penetrates the siding can drain to the exterior, but most importantly it allows the wall to breath and stay dry. Each roll of Driwall Rainscreen contains 260 square feet and has a 3.5-inch fabric overhang. This overhang of fabric assist in the installation process and provides a bug/leaf screen at the bottom of the wall.